Before we start, I just want to give a quick shoutout to YOU. Thanks for gracing my website with your presence. Just to be straightforward, I earn money from eBay for anything that you buy there- so any link or picture in this article that you click on will be tracked and earn me money on anything you buy. I really appreciate you supporting this website! Assuming this is your first time here, I just wanted to let you know what we are all about. 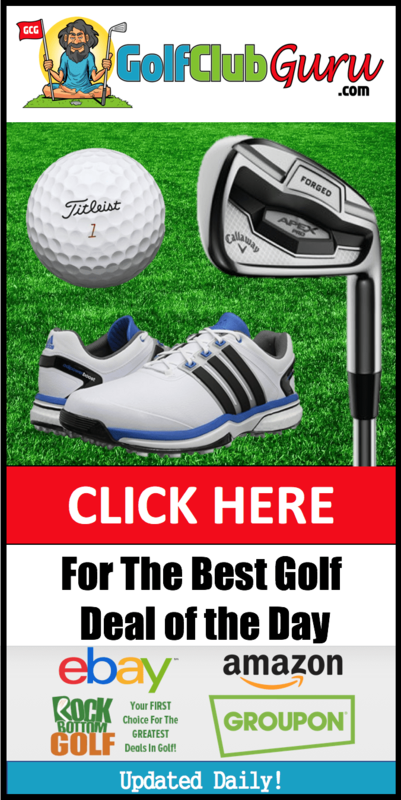 GolfClubGuru.com focuses on saving money on golf clubs. For that reason, I never really recommend people buy brand new, freshly released clubs. They are overpriced and will lose value sharply as time goes by. You are paying a lot of money for the small amount of improved performance you get. That’s just me though — you do you. 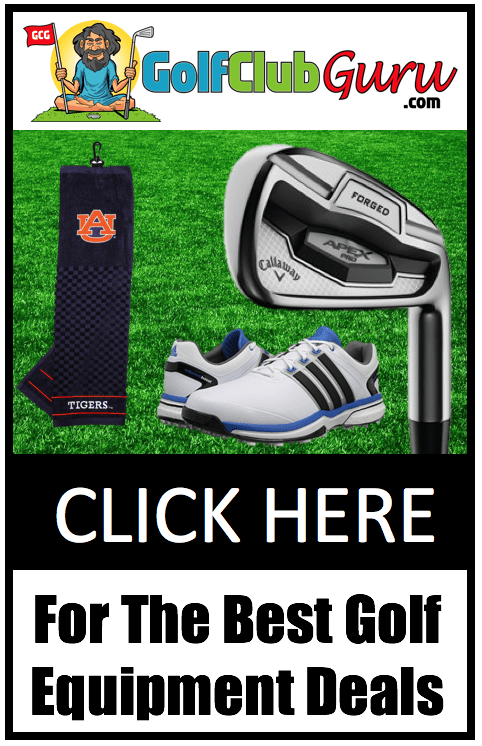 However, I still enjoy writing articles, and I know that most golfers want the best of the best in golf equipment. So, before we talk about the new clubs, I encourage you to check out my “Best on a Budget” golf club recommendations. They will perform nearly just as well as the clubs that I am about to mention… but at a fraction of the price. Alright, my rant is over. Let’s go!! Who needs super game improvement irons? Beginners, most senior golfers, very high handicappers, and those that simply struggle with hitting the center of the club face consistently. Super game improvement irons are waaaaaay underutilized — way more golfers should be using them. So why aren’t they more popular? Well, super GI irons can get a bad rap at times. People have big egos, so they don’t want to use the “easy” clubs. Plus, they are clunky, so they are not as attractive for some people. That’s really about it. If you can get over these small downsides, here are the two benefits you’ll get by using super game improvement irons. Much More Forgiveness: This is the main benefit! Super GI irons are the most forgiving clubs that you can buy. That means that you don’t have to hit the dead center of the club face to hit a good shot. They have large soles and large top lines. They have a lot of perimeter weighting, and their sweet spots are huge! For those reasons, they are perfect for beginners, senior golfers, and any other golfers that simply struggle with their ballstriking. More Height on Your Shots: super GI irons are designed to launch the ball as high as possible. Therefore, they are perfect for those with slow swing speeds or those that have trouble getting enough height on their shots. The center of gravity (COG) is much lower for super GI irons, which encourages the ball to be launched at very high angles. If you have determined that super GI irons are best for you, check out the top sets that you should buy. This list will be updated throughout the year for new releases. Callaway has captured a large part of the market share when it comes to super GI irons. They know how to make ’em long, and they know how to make ’em easy to hit. They have produced tons of iron sets in the past 10 years that have dominated amongst high handicappers. The Callaway Big Bertha 2019 irons are no exception. They have brought back the famous “Big Bertha” name, but added even more forgiveness than before. You won’t see any noticeable difference in distance, as that is basically maxed out all ready. There are a few different technologies at work here, but I don’t want to bore you with them. After all, who wants to hear about “a new internal, multi-material weight system” and “Suspended Energy Core comprised of a uniquely shaped, metal-injection-molded (MIM) internal tungsten weight”. Who the hell writes that stuff anyway? Come on guys. Here’s what they basically did: they made the face a littttttttle thinner and moved the center of gravity a bit lower. That means fast ball speeds and a tad bit more forgiveness than previous models. That’s all you really need to know. It’s still not a significant enough difference to warrant an extra $500+ compared to older, slightly used models. Who needs game improvement irons? Mid to high handicappers & golfers that want much more distance with forgiveness (not as much forgiveness as SUPER GI irons though). Game improvement irons are by far the most popular type of irons. The combination of distance and forgiveness is exactly what most golfers want, even if they truly NEED super game improvement irons due to their inconsistency. With that being said, it’s not a bad idea for super high handicap golfers to use GI irons (instead of super GI), because they will hopefully improve their ballstriking and grow out of super GI irons over time. Game improvement irons are the longest irons on the market. Club manufacturers know how important distance is to most golfers, so their longest irons always fall into this category. How are GI irons different than super GI irons? GI irons are longer but slightly less forgiving. How are GI irons different than players irons? GI irons are longer and more forgiving, but have less workability and distance control. 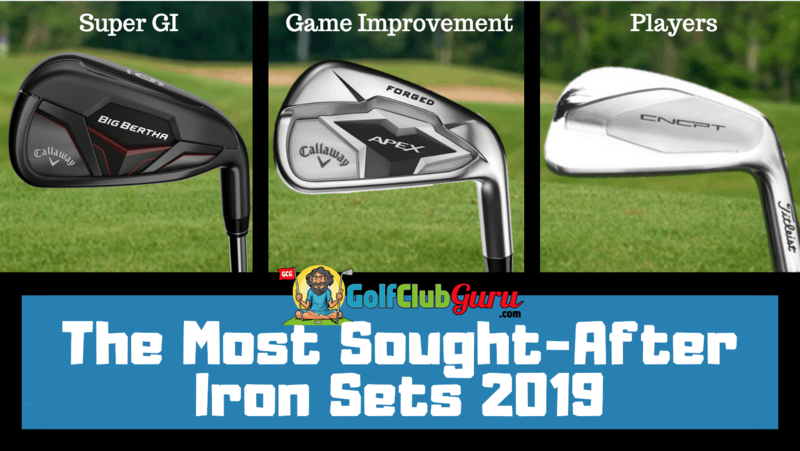 Here are the top game improvement iron sets that you can buy in 2019. I’ll update the list whenever new irons are released. As I was writing this article, I got word that Callaway had just released their new irons for the year. The Callaway Apex 2019 irons, assuming they are similar to the previous models, is set to become one of the most popular iron sets all year. The Apex irons are the perfect combination of distance and forgiveness that most golfers are searching for. Here’s the main difference with these irons though: they are way more compact than most expected. With the updated Apex irons, Callaway wanted to deliver more distance in a design that would appeal to better players. That means that golfers that WANT a sleek profile iron (but know they aren’t good enough to game one) can now game one that is still very forgiving. That’s a huge plus, as more and more golfers are leaning towards a more attractive, slimmer topline design with better feel. With the Apex 2019, mid to high handicap golfers will have it all: distance, forgiveness, AND feel. The Callaway forging process will have golfers that have yet to hit a forged iron purely addicted to the forged feel. Try it out for yourself if you have the opportunity. Is it worth the price increase from the previous Apex model? That’s up for you to decide, but I would say probably not. Mizuno has drastically increased in popularity in the game improvement iron category in the past couple of years. I’ve been playing the Mizuno JPX 825 Pro irons for around 4 years, and I’ve been super pleased. If I were looking for a new set to update my current irons, this is more likely the set that I would choose. I’ll be honest, though: these are pretty pricey. If you currently don’t have the funds, I’d suggest an older set like I currently have. The Mizuno JPX 919 Hot Metal irons are a set that I would suggest to any mid-high handicappers if the funds are there. Like the Apex irons, it’s a great combination of distance, forgiveness, and feel. The feel & sound of a perfectly hit shot will blow you away if you haven’t experienced it before. If you can find a poor review of these irons, I’d be surprised. Who needs players irons? Low handicap golfers, great ball strikers, and those that simply like the look/feel of players irons (after all, golf is all about fun). If you aren’t sure if players irons are for you, they probably aren’t! Only a small percentage of golfers should really be playing players irons. I’d estimate that amount to be close to 5%. Why such a small number? Because, most people would simply perform/score better with super GI or GI irons. What makes players irons so exclusive? They are harder to hit (less forgiving): Players irons are notoriously harder to hit. The sweet spots are smaller. Mishits end up being punished badly. The toplines and soles are typically much smaller, so there is a smaller chance that the club will bounce off the ground and still make good contact with the ball. Average golfers simply need more forgiveness. They are typically shorter than GI irons: Distance is not the main goal of players irons. What is the main focus? Distance control, not distance. If a great ballstriker used a GI iron, he would hit the ball longer but the distance would range + or – 10 yards on each shot, even if he hit the center of the club face each time. If that same golfer used a players iron, his variance would be closer to + or – 3 yards. That’s a huge difference! Note: players irons are still pretty long, just not as long as GI irons. They are easier to curve the ball: Players irons are much more “workable.” That means it’s easier to curve the ball left and right when needed. However, most golfers already curve the ball way too much, so they don’t want more workability. Great golfers, however, can use the workability to their advantage in players irons. They can start the golf ball at the center of the green and curve the ball towards the flag. That way, if the ball doesn’t curve, they are still in the center of the green when they putt. If you are in the small group of golfers that need/want players irons, check out these great options below. Whenever more options become available, I’ll update the list. So far this year, Titleist has killed it with their new TS2 and TS3 drivers. They intend to back that up with a new set of players irons in the Titleist CNCPT. They are being classified as distance players irons, so I can imagine them being very popular among low handicap golfers that still have the urge to increase their distances. As always, no matter what handicap you are, it’s better to have an 8 iron into a green than a 6 iron. Some of it is psychological. Some of it is related to more loft on a club head allowing a higher launch angle and less spin. That’s a great formula for longer iron shots. Either way, a distance players iron is sure to succeed in 2019. When it comes to price, it’s rumored the Titleist CNCPT irons are going to expensive… really expensive actually. But, hell, you’ll get a blade iron that offers incredible speed and feel. What more could a lower handicap golfer want? Plus, from the pictures that have been released so far, these are some of the most beautiful players irons that I have ever seen. Thanks for ones marvelous posting! I really enjoyed reading it, you can be a great author.I will remember to bookmark your blog and will eventually come back later in life. I want to encourage you to definitely continue your great writing, have a nice day!